4.0 out of 5 starsGreat chemistry between couple. An engaging storyline. Ava Baker, publicist extraordinaire and successful career woman is about to experience the most awkward of times. Matthew Hawkins, her teenage crush comes back into your life. Yes, the crush that she hid because she was too young and more importantly, Matthew was engaged to her sister. Erm … yes. Imagine those family dinners! I thoroughly enjoyed THE EX EFFECT. It is well plotted, the pacing is spot on and even with some incredibly uncomfortable scenes, none of the characters exhibit any too-stupid-to-live moments. Ava is a great heroine. She is a capable adult that shines in her profession. She’s definitely got a sense of humour and she proves herself to be a good friend. Her family on the other hand… not so good. As upbeat as the book was there were times the book had me in tears. Ava realises her family’s treatment of her has impacted how she interacts with people she love, and it’s something she needs to address to get her happy ever after. Ava and Matthew have excellent chemistry and their scenes together are a pleasure to read. THE EX EFFECT was my first Karla Sorensen read but she will definitely be added to the rotation. Highly recommended. I couldn’t get enough reading this! It was so much more than expected to be honest. Filled with so much heartache and swoon-worthy moments, Matthew and Ava had me flipping through the pages with ease. The Ex Effect is my first story by Karla Sorensen—it won’t be my last! "This was something I could trust, this instinct to lean more deeply into her, into what I felt when I was around her." Matthew Hawkins is larger than life; a sweet and gentle giant with a caring soul and addictive personality. He also has this certain charm and protectiveness that’s irresistible, you’ll want to wrap yourself up in it! Ava Baker is this hard-working and independent woman working within an industry flooded with testosterone, but she has her own brand of sassiness that keeps all the men around her focused and admiring her presence. When Matthew and Ava are together, there’s nothing sweeter! It’s an explosion of cuteness that will have your heart soaring; flirtatious moments that ease an underlying tension; a certain tenderness that will hit your emotions deep. They’re the sweetest, most perfect couple despite past circumstances. "I'd closed off big, important pieces of myself to a man who loved me because I'd never learned how to be loved in the right way." 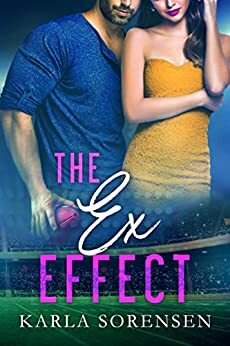 The Ex Effect is an interesting combination of various tropes—a forbidden, second chance romance between two old friends, bursting with so much heated chemistry and profound emotion, you’ll be invested in everything they do. I love that they lean into their relationship—though there's angst that underlies it that will make your heart pound in anticipation of what will happen next. Karla Sorensen writes contemporary romance right with heroes who are unforgettable, full of charm and are just perfect real characters. If you've loved her other story, The Bombshell Effect, you'll obsess over this one, too! This is the first book I have read by this author and I really enjoyed it. Well written with a good storyline and fun characters. Matthew and Ava were a perfect fit. It was tough how much they had to struggle against the circumstances and Ava’s family. Though I did come to like her Dad, they were all pretty horrible to her. I liked that Matthew saw how amazing she was and treated her as such. She was so smart and tough in her job, she needed to have applied that to her family too. I am glad they found their HEA, they both deserved it. I enjoyed that instead of the usual insta love, it was natural and sincere. Also that the relationship was fantastic not just because of the heat but also because it was just easy - they fit together. I hope Logan finds that in an upcoming book as I really came to like him. Gosh I loved this story. Definitely recommend if you're looking for smart and funny with a dash of hot! Ava is a fantastic character - believable, relatable and seriously funny. I felt very protective of her and wanted to seriously smack her sister in the head (a lot). Matthew - well he is Delicious with a capital D. The best kind of sport romance hero. Their story is complicated by their shared history and the baggage both of them have from their pasts. But who wants an easy love story - not me! Their connection was genuine, their chemistry was seriously hot and although the "heat" factor of this one is lower than what I usually read it was definitely HOT! Add in some intriguing side characters (who I'm hoping get stories of their own) and you've got an awesome read. Highly recommend. A real page turner told in both characters POVs, which I love. I loved the sports side of the story and the battles the characters have to face to make their relationship work, absolutely loved Logan, just wanted to give that guy a hug until he thawed. I really enjoyed this read. Normally a NFL love story is the classic womanising player realises his life is empty after to meeting the heroine. This was a great story as the author had a nice twist where the hero had already been through that part of his life. I liked her take on this story. Well written and really engaging. A solid read for anyone who loves a HEA. If you like sports romances with great characters and fantastic writing then this one's for you. Can be read as a standalone, but the first book is great too, would recommend reading it first. I really enjoyed this title by Karla Sorensen, my first novel by the author. It's book 2 but clearly they can be read as a stand alone because I haven't missed anything.